Our typical summer storms arrived this weekend. heavy rain, thunder, lightning & even hail late Sunday afternoon. whilst sipping on a cheeky chardy!! Plus I'm offering another giveway to one lucky reader. inHomewares is celebrating it's third birthday this month, so I'm giving one lucky reader a present. 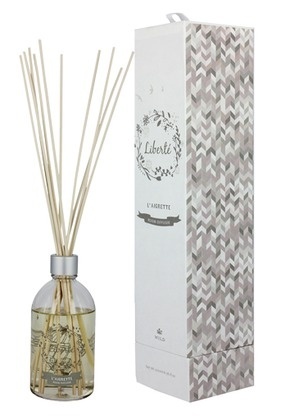 The gift is one of my stores most popular lines...Wild Room diffusers. Have you ever or do you use a Reed Room Diffuser? Reed diffusers are a great way to add continuous fragrance to any room — especially if you prefer flameless aromas to freshen areas around you. If you have never experienced the uniqueness and beauty of a reed diffuser, you owe it to yourself to try one. With so many tantalizing scents in our collection, you will surely find a diffuser with a fragrance you like. Our "Wild" collection is 100% Australian made combining the highest quality Australian fragrances & oils. The fragrance can last up to 9months, which makes them an economical choice for home fragrance. To enter three things must be done:- 1. make a comment here which is your favourite fragrance 2. like our inHomewares facebook page 3. share this page on your blog or on your facebook timeline. It's that easy. Competition closes Sunday night at midnight. Winner announced on Monday. For more information on "Wild Room Diffuser" visit my store www.inhomewares.com.au & click on "accessories" then "home fragrance". **Sorry this competition is only open to Australia & New Zealand followers. my little man next year will embark on the next chapter in his life....school. today was orientation morning. i had to leave him for a couple of hours, whilst he met teachers; new friends and had time to explore his new learning environment. we hugged and kissed goodbye....both with mixed emotions. i will miss my little friend, so will little miss cheeky. this little boy stole my heart five years ago. when i first lay eyes on this gorgeous round little ball with thick black hair and such chubby cheeks...i was gone. totally and utterly besotted and still am! he is such a caring loving soul. he loves to explore, question and investigate everything in life. i love been the fly on the wall and observing him at play. he can happily entertain himself for hours and goes off in his own little world. one day his buzz light year, next batman and maybe even a pirate. his dress up box is huge! when in costume he embraces the persona of the character in every way. he is such wonderful company, i love our conversations we have and hearing his constant chatter. my little man is so ready for this next stage in his life, he is super keen to learn, wear a uniform and see his big sister in the playground. i'm happy for him but also sad this part of our lives will soon be over. finally we had rain on Saturday which was such a delight, as we so desperately needed it. collecting flowers; cutting, gluing and drawing. hubby & I competed in a mountain 10.5km charity fun run. it was fun to lace up our runners together and join the fight against men's health issues, specifically prostrate cancer and depression in men. mending was done..the pile was getting a bit out of control. it is a task that i hate, but feel so pleased it's done. so are my kids, as most of it was their uniforms & an outfit for little miss cheeky was adjusted. life has gotten a bit crazy lately and my poor sewing machine was a little neglected. so I spent a few hours happily sewing. pinning was also accomplished with a quilt, so now i can commence the quilting. thank goodness friday was spent with my little ones farming. a bus full of city slicker kindy kids and parents, experienced farm life for a day. this little cushion was created for a little man who recently turned 3.
he loves cars and building blocks and theme colour was red. the backing ticking fabric ties in with his Roman blinds. if you were out Melbourne Cupping, hope you had fun and maybe lucky on the punt! my family was struck down with the tummy bug last week, I smugly thought I survived it, until yesterday I woke buckled over. whilst i couldn't move off the couch, my little man was amazing. entertaining little miss cheeky and getting snacks (healthy & not so healthy, but i was in no state to care). we all survived the day, and when the big ones got home from school they assisted in chores. with that said....today I couldn't think of going out lunching or drinking bubbles. so my little man & I watched the races on tv together - to be honest, that was the perfect race day for me!! tell me how you spent Melbourne Cup? starting feel bit like Christmas!! here are a couple of the new lines which are now available in my little store. plus i've tried out instagram for the first time. i'm so not techno savy, these images show my first attempts at this new app. it's rather fun! these white metal ice/drink buckets are fabulous. Come in two great sizes. I love the rope handles. hope you've had a fabulous week in your little worlds.